Global Mining Equipment Market – Industry Analysis and Forecast (2018-2026) – By Product, Application and Region. Home » Reports » Mining And Metals » Global Mining Equipment Market – Industry Analysis and Forecast (2018-2026) – By Product, Application and Region. 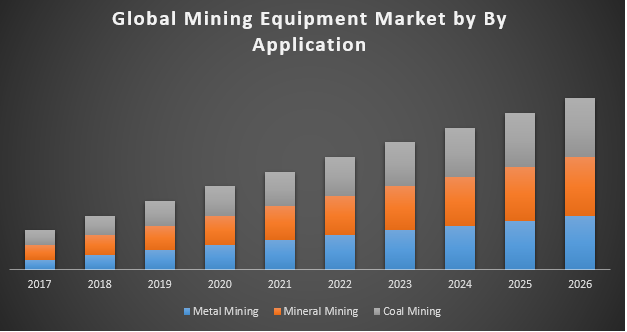 Global Mining Equipment Market was valued at US$ 76.4Bn in 2017 and is expected to reach US$ 114.2Bn by 2026, at a CAGR of 5.15% during a forecast period. Mining equipment such as draglines, excavators, and transport trucks are used to move mined ore from mines to processing units. These machines should operate with limited downtime to ensure seamless operations and to reduce the operating expenditure. Major driving factors of the Mining Equipment market are the growing exploration and drilling activities on a global level. Several mining companies are adopting smart technologies such as digitalization and automation to improve their productivity in metal steels which are using across industries, which include also construction, transportation, manufacturing, and a variety of consumer products. Companies are automating their mining operations to improve productivity and to reduce the number of accidents. Increased demand for minerals used in clean energy, rapid urbanization and industrialization across the globe, increased demand for power generation has led to an increased demand for coal, which plays an important role in energy production and creating opportunity mining equipment as well. Depletion of natural resources and High cost of associated system will act as restraint to the market. Based on the Product, Crushing, and Pulverizing mining segment is expected to hold the largest share in the market during the forecast period. Crushing, and Pulverizing are used for cutting in to break down large pieces of large material into smaller pieces suitable for further processing. Different materials are reduced in size by fracturing them. The material is crushed and pulverized between the hammers and the casing and remains in the mill until it is fine enough to pass through a screen which forms the bottom of the casing. Crushers are generally stationary equipment that are heavy and built into a plant. The various types of crushers are cone crushers, jaw crushers, split feed crushers, glass crushers, gyratory crushers, and stone crushers are creating opportunity in these segments. In Application, Metal mining is also expected to lead the market growth. Driving skyrocketing growth for the metal mining equipment market is a heightened demand for metals like steel and aluminum in the construction and manufacturing industries. Another key factor driving demand for metals is rapid urbanization in developing economies like India and China. In terms of region, Asia Pacific is expected to hold the largest share in the market during the forecast period. The sheer size of population growth and the speed of urbanization in China and other Asian countries, coupled with ongoing requirements in the south Asia has created unprecedented demand for minerals and metals. Strong demand growth comes mainly from millions of aspiring in emerging economies like India, China, Indonesia, and Thailand are striving for a better material standard of living. China, however, remained the region’s leader in terms of growth in consumption, especially for such mineral commodities as aluminum, cement, coal, copper, iron and steel, lead, natural gas, crude petroleum, phosphate rock, rare earths, tin, and zinc. The report includes a detailed study of Porter’s Five Forces model to analyze the different factors affecting the growth of the market. Moreover, the study also covers a market attractiveness analysis, brand portfolio expansion, mergers, collaborations, joint ventures, acquisitions, PESTLE analysis, Value Chain Analysis, and SWOT analysis.